THE MOST COMFORTABLE STOOL A SURGEON CAN USE! The Elmed Surgeon Stool has no equal in comfort & practicality. 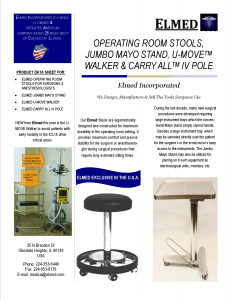 Made exclusively for Elmed to be sold in the USA, this surgeon’s stool features a Heel/Toe controlled height adjustment system. The surgeons hands are always sterile. He never has to use them, request outside assistance or remove him/herself from the stool to raise it up or down. THE ELMED JUMBO MAYO STAND EXCEEDS EXPECTATIONS! The ELMED JUMBO MAYO STAND is mounted on a T-shaped stable base of stainless steel. Thus, even equipment can be placed on it without the risk of tipping. The base is also fitted with electrically conductive wheels that feature a locking mechanism.